44mm black dlc-coated stainless steel case, screwed black dlc-coated stainless steel back, screw-down crown with 2 o-rings, Unidirectional turning bezel with details in relief, flat sapphire crystal with double anti-reflective coating, black dial with luminescent indexes, automatic chronograph Montblanc 4810/501 movement with 12 hr and 30 min counters, central chronograph hand, approximately 46 hours of power reserve, black alligator strap with triple-folding buckle. Water resistant to 20 bar (200 m). 44mm stainless steel case, screwed stainless steel back, screw-down crown with 2 o-rings, Unidirectional turning bezel with details in relief, flat sapphire crystal with double anti-reflective coating, silver dial with luminescent indexes, automatic chronograph Montblanc 4810/501 movement with 12 hr and 30 min counters, central chronograph hand, approximately 46 hours of power reserve, black alligator strap with triple-folding buckle. Water resistant to 20 bar (200 m). 44mm stainless steel case, screwed stainless steel back, screw-down crown with 2 o-rings, Unidirectional turning bezel with details in relief, flat sapphire crystal with double anti-reflective coating, black dial with luminescent indexes, automatic chronograph Montblanc 4810/501 movement with 12 hr and 30 min counters, central chronograph hand, approximately 46 hours of power reserve with triple-folding buckle, stainless steel bracelet. Water resistant to 20 bar (200 m). 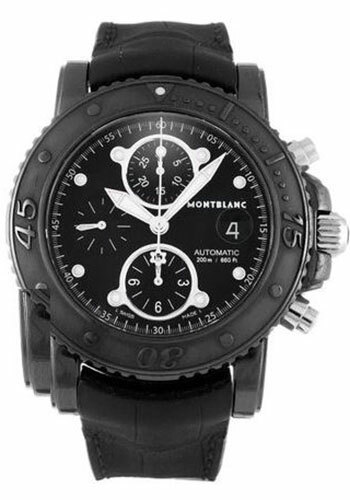 41.5mm stainless steel case, screwed stainless steel back, screw-down crown with 2 o-rings, Unidirectional rotating bezel, flat sapphire crystal with anti-reflective coating, black dial with luminescent indexes, automatic chronograph Montblanc 4810/501 movement with 12 hr and 30 min counters, central chronograph hand, approximately 46 hours of power reserve, black rubber strap with triple-folding buckle. Water resistant to 20 bar (200 m).